This morning was bright and sunny. 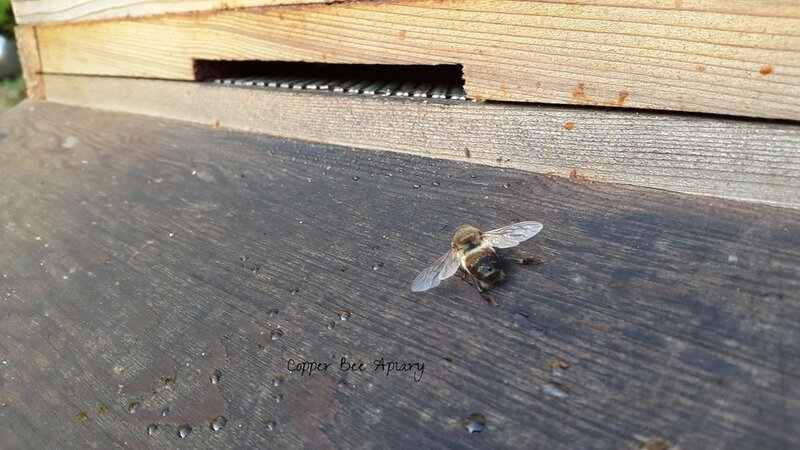 I went outside to stand in the welcome November sun, and saw a large bee on the landing board of the Copper hive. It was a drone - a male bee - recognisable by his size, his fuzzy roundedness and his big eyes. It's unlikely that he spent a cold, damp night on the landing board out of choice. He is reliant on his sisters - the worker bees who do all the foraging, make all the honey and run the hive - for food and shelter. The drone exists only to mate, but that is a spring/summer activity; there are no virgin queens looking to settle down and start a family at this time of year. So as the colony in autumn undergoes that process that corporate entities euphemistically refer to as "rationalisation and restructuring", a drone can find himself surplus to requirements. The ground in front of an autumn hive is littered with drones who have received their notices of redundancy, dying from exposure and starvation. Let us hope that he had a nice summer, spending the long days lazing around, eating honey and flying out in the afternoon to drone congregation areas to hang around in the hope of meeting a nice young queen. Evidently he did not actually succeed in mating, since if he had he would not be here...mating being a terminal act for the drone in much the same way that stinging is terminal for the worker. When the sun warmed the front of the hive, the workers came out but the drone lay still. I went out again later and he had gone. Perhaps he was still alive and went in to the hive or flew away. But I rather suspect he was carried off by an undertaker bee tidying up. It doesn't do to have dead bodies piling up by your front door. It was cold last night. 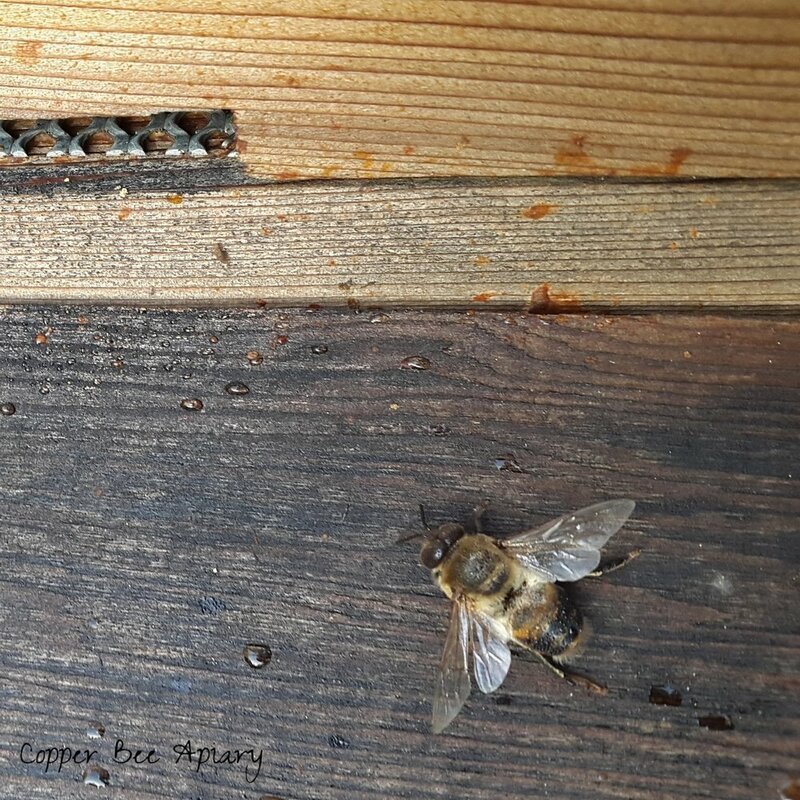 Here on the Copper hive landing board, two drones and a pollen forager have been caught by the frost. My book says that all drones are gone from a hive by September. Evidently that is not the case for the Copper hive. It may be that the strength of this colony has allowed it to support more drones for longer. But probably the book is just oversimplified. By the time September comes, all the drones will have been forcibly ejected from the colony by the workers.